Does playing the didjeridu connect you to Aboriginal People? While not often talked about and even less commonly made in its specific ritual form, the Yirritja moiety yidaki Dhadalal is a public instrument, used in Garma, or open public ceremonies. The sound of a series of sustained trumpeted notes on the Dhadalal is a call to funeral ceremony for all clans, Dhuwa and Yirritja, ever since the time of a Yirritja ancestor played it at the Gumatj land of Gulkula, site of the annual Garma Festival. 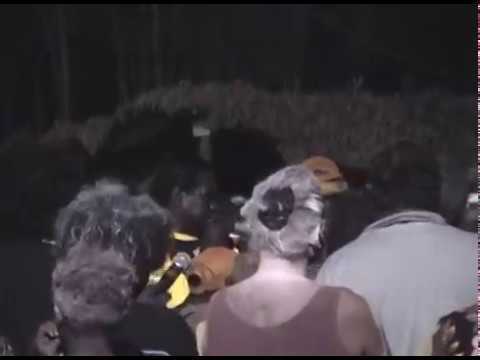 The ancestor is known to the Gumatj clan as Ganbulapula, although he had more identities as he travelled across different Yirritja clans’ lands, all the way from Gupapuyŋu clan country in the far west of the Yolŋu cultural bloc. Madarrpa clan (Yirritja) leader Djambawa Marawili demonstrates the ceremonial call of the Dhadalal at the 2004 Garma Festival Yidaki Forum. Djapu clan (Dhuwa) yidaki player Milkayŋu Munuŋgurr plays the Dhadalal in ceremony for his mother’s Gumatj clan (Yirritja) at Garma 2004. 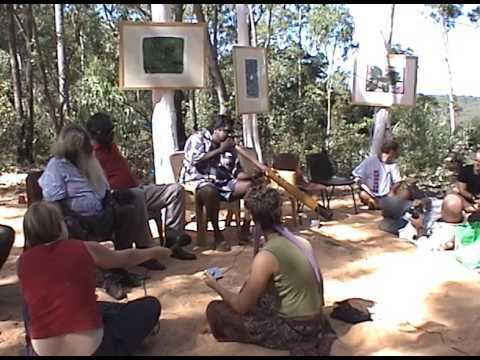 Here Dhalwaŋu clan (Yirritja) leader Gawirrin Gumana introduces the Dhadalal at the 2004 Garma Festival Yidaki Forum. Yidaki is not only for one person, yidaki is for everybody. Yidaki is Dhuwa and Yirritja. But my name and Galarrwuy, Gumatj and Madarrpa Dhadalal, not yidaki, Dhadalal. Dhadalal is something, this is where he’s been play and dancing by this one (holding up Dhadalal). This music or this natural, it Dhadalal. Dhadalal is something about Yirritja people, like me and Galarrwuy and Djambawa. Ga we in the Garma. This yidaki, or this Dhadalal, for Garma only, not for ordinary ceremony, not for ordinary song. This is for Yirritja people, only special, like Garma now, and a death. Person, dead person, anyone, like woman and a man ga boy, we can use this. But not like this one, this one only today. Not only today, but my father and his father was been tell us, “and you can make like this one, that’s the name of Dhadalal. “Yow, you can hear, or hearing a different sound, this was only for Dhadalal. When you heard from Djalu’, it’s gonna be a different, different sound, what we call rirrikay, rirrakay. Ganbulapula, Ganbulapula story, I heard from my father and his (Galarrwuy’s) father, and my brother, Djambawa’s father. Dhadalal can using for some reason, way of farewell to a dead person, when they die, death, and dhadalal can using for, like Garma. Garma is special name, I mean for open name, where everybody can use it, young and old, and children. Garma been dancing by yidaki in the garma. In the garma, from garma, sent to every clans, and every tribes, every tribe, yothu-yindi yothu-yindi yothu-yindi, they can come. Galarrwuy and Miniyawany (Djambawa), we like taking over from old people. Today we are taking over, and after that one, when I die, maybe these two can take over, or maybe their children can take over. Not cut across, something, Gonna follow line. Follow line, They can make it like this, never know, I don’t know. Or maybe they will make a ordinary yidaki, dhadalal. Maybe they can tell a story like what we are talking about now, and what my people was been talking about, old people, like Mungurrawuy, Birrikitji. That’s our father, they’re two closer, like brothers. Mungurrawuy (Galarrwuy’s father), my father Birrikitji, they used to walk together. For this (the Dhadalal). Not only this, but even this one (the feathered strings). The special one. Special, but you can see, we can open it. Because our father, Mungurrawuy and Birrikitji, was been said, “you can show it to people, so they can know about this one” (holding feathered string). Or learn it something, but not take away, not copycat. No. Our special own, property for all the Yirritja people. Not make. You can’t make it like this, no,. You can’t make it. Otherwise you can get in trouble for yourself. But listen ŋarraku dhäwu, my dhäwu (my story) and these two. Below are excerpts of Ganbulapula’s story as told by Gumatj leader Djalaliŋba Yunupiŋu, Mungurrawauy’s younger brother, with Rirraliny, Nalpinya and Yirrinya Yunupiŋu, referring to but never naming the Dhadalal. Ga dhuwalana lili ŋayi wandinanydja, bala dhuwalana ŋayi wäŋanydja mulkana. Wanhaŋuwuy ŋayi ŋunhi Ganbulapulanydja? Ŋurukuwuy bala, Gupapuyŋu. And he ran here, and arrived at this place. Where is Ganbulapula from? Over there (to the west), Gupapuyŋu land. Ga dhiyakuwuynydjau Ganbulapula, bäpurru Gumatj ga Lamamirri. Bili dhuwalanydja wäŋa Gumatjku ga Lamamirriwu ga Wangurriwu. At this place, Ganbulapula is Gumatj and Lamamirri. Because this land belongs to the Gumatj, Lamamirri and Wangurri clans. Ga nhumanydja wiripu-gulkuny’tja Yirritjakunditjthu, ŋuli rrambaŋi ŋilimurru, dhipala miyaman manikay. Nhäku ŋilimurru ŋuli miyamandja dhipala? And you other Yirritja clans, we all sing songs of this place together. Why do we all sing this place? Gumatjkuŋu, Dhalwaŋu’kuŋu, Maŋgaliliwuŋu, Madarrpa, Liyalanmirri, Ritharrŋu, Lama, Wangurri, Warramiri ga Gupapuyŋuwuŋu. Ga Gumatj Dhä-dhudilili ga Dhä-gupalili, ga balakurru bili, ŋilimurru ŋuli waŋganygurru waŋanhamirrinydja. from the Gumatj, Dhalwaŋu, Maŋgalili, Madarrpa, Liyalanmirri, Ritharrŋu, Lamami, Wangurri, Warramiri and Gupapuyŋu. And the bottom and top Gumatj clans, through this way. We all talk together as one. Ga yidakinydja dupthurra bitarra bala Yarrapayyu, Wurrwudiyu; ŋuruku Dhuwawu mokuywu Dhanbulwu, Nyedilwu. The yidaki sounded across to Yarrapay, Wurrwudi, for the Dhuwa spirits called Dhanbul or Nyedil. “Do-o-o-p,” bitjarra. Ŋunhawala Yarrapayyu, Dhaŋalaŋal’yu, Witiyanayu, Wurrwidiyu. Ga bitjarra bala dopthurru Dhäyulkulyu. Walala yukurrana giritjinanydja dhiyala, mokuy walala Yirritjakunditj. Ga walala, Dhuwanydja walala ŋunhala Yarrapay ga Dhäyulkul. They were dancing here, the spirits of Yirritja clans. And the Dhuwa spirits there at Yarrapay and Dhäyulkul.